Luckily, there’s a group of writers who bravely air their fears and worries once a month and offer comfort and support to those who need it. Click here for a full list of participants. Today’s optional question is: Besides writing, what other creative pursuits do you have? Instead of talking about my other creative pursuits (mainly knitting and graphic design), I thought I’d tell you about one of my greatest fears. I’m afraid that people won’t understand. That even after they’ve read my story, they won’t understand and won’t care about the characters I’ve spent so many years getting to know. It might be the same sort of fear you feel when you bring your beloved boyfriend home to your family for the first time. You want them to love him as much as you do, but you have a sneaking suspicion they probably won’t. You can see he’s got a heart of gold, but he’s also got a tattoo and that isn’t really their thing. But it’s also deeper than that. Because these people in this story aren’t just people. They aren’t my friends or my parents or my lovers or even strangers wandering past on the street. A hundred different versions of myself, transformed and changed by visions of other lives leading other places than mine has. And aren’t we all afraid of that? That if we revealed our true inner selves the world would look back at us with blank stares and quiet mutterings of “I don’t get it”? What is your artistic insecurity? What are you afraid of? Share it with me in the comments and we can support each other! My debut did well, but things have changed since then, both in my life and with book retailers and algorithms. I don’t fear being a bad writer so much as I fear that I’ve lost the momentum I had. It’s frustrating. Someday I’ll have time to devote to writing and marketing again. That’s the fear when we pour so much of ourselves into our writing and characters. And some people won’t get it. Your story wasn’t for them, so don’t worry about it. Focus on those who do get it. Thanks for the warm welcome and the good advice! I’m afraid I’m never going to finish writing my current WIP. I’m afraid I’ll never get it published. I’m afraid no one will read it. I’m afraid no one will like it. I’m afraid it’s going to annoy somebody and launch a twitter storm against me. It’s all part of the neurosis of being a writer. Welcome to the club (no seriously, welcome to the IWSG)! There are always people who won’t “get” what we do, or like what we write. But somewhere out there are people who will. So we just keep writing for ourselves and hope we find them. The Undeserved Twitter/Instagram Storm is a thing we are all justified in being afraid of these days. Thanks for the welcome! Very well worded, and so true! To write is to expose ourselves, versions of how we see and feel. It can be immensely rewarding when people say “I hear you and like you” but if they don’t do that, if they reject us, it can be awful. Well put yourself! Yes, I think sorting books definitely helps them find their way to the right readers. It also definitely helps to try to remember to separate “myself” and “my work” so people not liking my work doesn’t translate to people not liking me. I get what you’re saying. I used to tell people that hearing someone badmouth my book was like listening to people insult my kids. Now, my skin is a bit thicker. I realize that no matter how perfect, no one book will suit every person. I just quit reading the reviews constantly. I feel so much saner that way. Such good advice! Learning to accept good criticism is definitely a process. I don’t ‘fear’ that people won’t ‘understand,’ I am more concerned that they won’t ‘care.’ Like you, all of us who lay our imagination bare on paper have invested ourselves in the people, places, and events we have imagined into being. Over the months those characters have become friends, speaking our words in the voices we have chosen for them. And sadly, in this time when dozens of stories appear each day to compete for the readers’ interest ……so few of those potential readers seem to care about the people we have come to love, or hate. The storytelling-blogging bug must really have its hooks in us to put up with all that. It really does! Hope springs eternal, I guess 😉 I think after caring so much about our characters, we feel like they deserve to live out in the world even if there aren’t a horde of readers waiting for them. Welcome to the IWSG, Tyler-Rose! I used to be afraid that I would be labelled a “fraud”… afraid that I was not a “real writer”. It’s the good, old, faithful Impostor syndrome that rears its ugly head from time to time. Though not so much anymore. I’ve gotten to the stage where I ignore it. 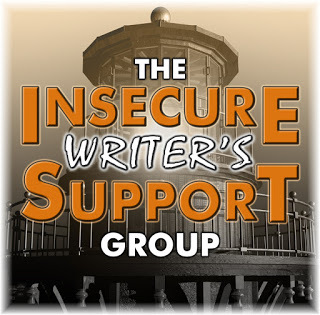 Just a reminder that we also have a facebook group as well as a Twitter and Instagram page where you’ll find loads of ongoing writing-related/book activities to keep those writing muscles sharp! This made me laugh! I’ve heard this quote before, but it’s always good to be reminded of it. Sometimes we’re so busy worrying about our own insecurities that we forget other people have them too.